On a week full of upsets, there was a big one in the Big 12. The 4th-ranked Oklahoma Sooners traveled to Fort Worth to face a No. 25 TCU team. It wasn’t a pretty football game. On one 2nd half Oklahoma fumble, both teams scored. 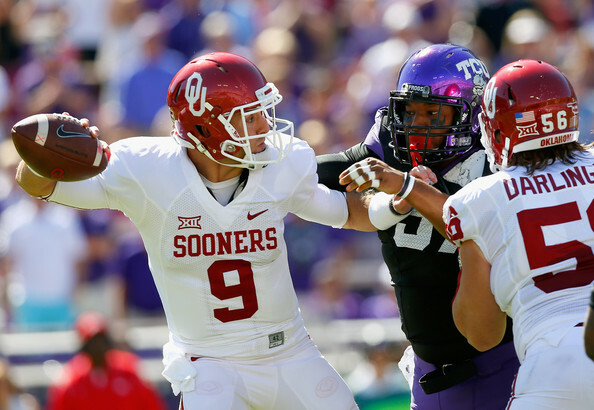 TCU picked up the fumble and returned it for 6 and then Oklahoma blocked the PAT, returning it for 2. I can honestly say that I had never seen anything like it before. I think that the most disappointing part of that very strange play, is that it was the final score of the game. Yes, the final score in a nationally televised top-25 matchup was a scoop-n-score with a returned blocked PAT. A lot of people are saying that Trevor Knight is overhyped based on this performance, I have to disagree. I watched Knight play in high school – the kid’s good. He’s just inexperienced. He only made five starts as a RS Freshman last year. With more experience, Knight will get to the point where people forget this game. Knight just needs time, and he’ll get it. He’s only a sophomore. A few hours south on I-35, No. 7 Baylor was in Austin to face the Texas Longhorns on ABC. The game started off well for the Horns, as Baylor only took a 7-0 lead into the half. But, then the Baylor run game started coming around and the Bears were able to open the game up. Texas had the ball late in the 2nd half deep in Baylor territory off of a Bear turnover, but turned it over themselves to end the half. Charlie Strong’s Longhorns really need to limit turnovers on a team that’s already injury-riddled on top of inexperienced. Kansas State looked good against Texas Tech in Manhattan. Oklahoma State toppled Iowa State and West Virginia beat Kansas in Week 6. No. 16 Oklahoma State over Kansas – The Cowboys are on a roll. While some might argue that this could be a trap that catches Garman and the gang looking forward to TCU next week, I don’t think there’s any way OSU drops this game. Even in Lawrence. No. 5 Baylor over No. 9 TCU – The Horned Frogs jumped 16 spots in the poll by beating Oklahoma by 4 at home. Makes sense right? This will be a very entertaining game, both offenses powered by Bryce Petty and Trevone Boykin are potentially explosive and the defenses in this game are very skilled. The thing that gets me is it’s in Waco, and the Bears with Petty under center just don’t lose at home. Texas Tech over West Virginia – This is the perfect opportunity for the Red Raiders to get back on the right track. West Virginia challenged Oklahoma, but they haven’t looked good otherwise. The Mountaineer offense likely won’t be able to exploit the biggest glaring weakness because it’s their biggest offensive weakness – the run game. I think Tech can pull it back together and win this game in Lubbock. Iowa State over Toledo – There isn’t much to say about this non-conference game. The Cyclones should be able to overpower Toledo at home. No. 11 Oklahoma over Texas – The Longhorns continue to look better with the more snaps Swoopes takes. But, Oklahoma just lost and Bob Stoops hasn’t lost back-to-back games in what seems like an eternity – especially to Texas. It’s the Texas State Fair down in Dallas, but I’m taking the Sooners in this one.